Joan Blades is cofounder of MomsRising.org, MoveOn.org, as well as LivingRoomConversations.org—virtual organizations that have no bricks-and-mortar headquarters. Also a business entrepreneur, Joan cofounded the software company Berkeley Systems. Joan was nominated for Time magazine’s Most Influential People and has received numerous awards, including Ms. Magazine’s 2003 Woman of the Year Award. She is coauthor of The Motherhood Manifesto and author of Mediate Your Divorce. Nanette Fondas is a scholar, author, and educator in the fields of business sociology and economics. Her recent work has appeared in The Atlantic, Time, Slate, Harvard Business Review, Ms., Quartz, and Psychology Today. She is a former professor of business and current mother of four. 1MFWF: What do you mean by a “custom fit” in the workplace? 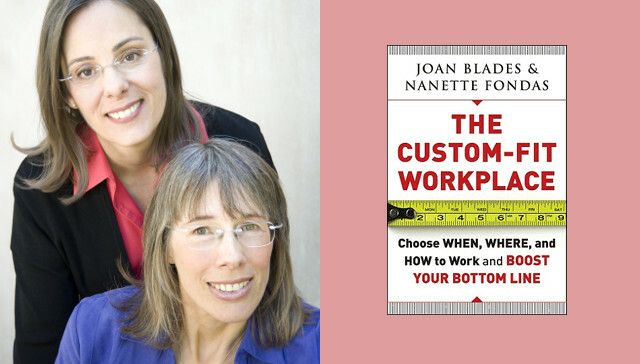 Joan & Nanette: We talk about a “custom fit” because work that is designed optimally for both the employer and employee creates a win/win. Giving workers the capacity to meet their responsibilities both at work and outside of work benefits everyone. There isn’t one uniform way to fit together the work-life puzzle for all people, at different points in the life course. A twenty-five year old single worker is different from a forty-five year old parent of three. Businesses can respect and leverage differences in the workforce in a way that empowers employees and the business to thrive. It’s a strategy grounded in respect and synergy. After that, we begin to design the tactics. 1MFWF: Is a “custom fit” workplace only possible for specific types of workers and industries—knowledge workers, for example, rather than, say, workers in manufacturing? Joan & Nanette: We can’t think of a workplace that doesn’t benefit from custom-fit opportunities. Different work environments have different opportunities to customize for appropriately maximizing the wellbeing of their workforce and, in doing so, improve the bottom line. High performance workplaces do beautiful work instilling respect-based management practices in factory environments. Custom-Fit practices that meet the diverse needs of a more diverse workforce are readily available and make it possible for workers to better meet their responsibilities both at work and outside of work. Flexibility, telecommuting, non-linear career paths, and results-based management are good for the bottom line as well for as the people who produce the bottom line. Years of research backs this up. In addition, new work practices are emerging to add to this list, such as job-sharing and taking babies to work. And new technologies are creating the possibility of future work arrangements we can only now imagine. 1MFWF: Businesses might interpret the word “custom” as both “expensive” and “difficult to manage”. Would they be right? Joan & Nanette: Heck no! “Custom” means work is designed to be an optimal fit for the employer and employee. Joan William’s Effective Scheduling program is a wonderful example of increasing profits and honoring workers’ needs in the low wage work world. Research by Ellen Kossek and her colleagues finds that supervisor training is key and quite do-able (they also show myriad heath benefits of doing so, such as reducing worker stress). 1MFWF: You ask in your final chapter, “Will change happen fast enough to meet the needs of today’s workforce and keep businesses and the country competitive?” It’s been six years since you wrote that—how do you think we’re doing? Joan & Nanette: There are some model businesses out there that treat workers with deep respect and reap the rewards, but this is not the norm yet. There is a great deal of room for improvement. Work cultures are typically pretty resistant to change. The better practices are very available, but the challenge is getting the deep buy-in of leadership and then entire organizations. 1MFWF: What steps can we take to help ensure the “custom-fit workplace” becomes the norm? Joan & Nanette: The more we can share the success stories of great employers the better. We all need to have a vision of how good work can be, and then weave these stories into favorite TV shows and other media. How about Hollywood makes a reality show: Work Place Makeover!